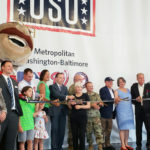 Colimore Architects worked with Harkins Builder, Inc. on the USO of Metropolitan Washington-Baltimore (USO Metro) logistics facility located at Fort Belvoir. 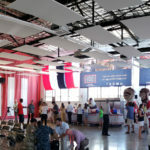 The project totals 12,000 SF and serves thousands of troops overseas. 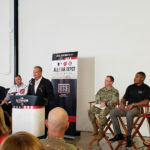 As part of the All Star Legacy Program, and with the help of Washington Nationals and Major League Baseball, the grand opening of the space took place on July 12, 2018 and Colimore was proud to be part of the team. The existing facility was without a proper heating and cooling system, which also meant that nonperishable food items were not accepted. 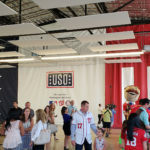 Colimore used floating ceiling panels and bright colors to enhance the space which will also be used for program and event venue for USO Metro.